For some it will be viewed as cynical move to extort more hard earned cash from long-suffering footy and gaming fans. To others it is a welcome and natural convergence of two key modern cultural elements of the beautiful game: e-sports and shirt collecting. To all, however, the launch of four strictly limited edition kits for the popular game FIFA 2019 Ultimate Team (FUT) was one that couldn’t be avoided. 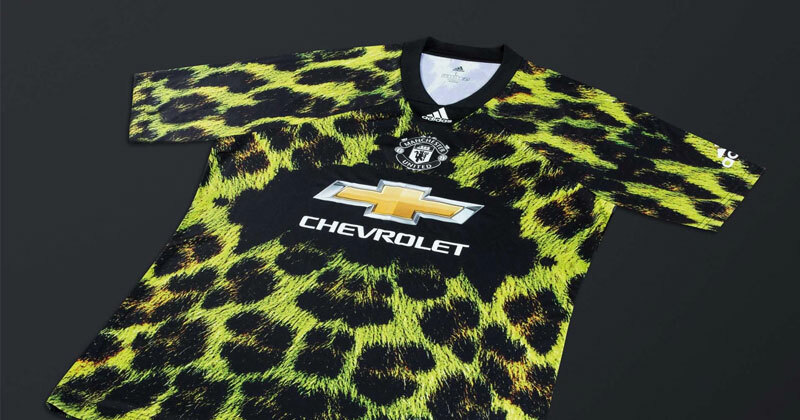 Forgive the cliche but the concept and the resultant shirts are as “marmite” as it gets. 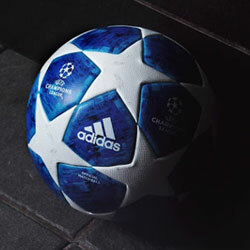 To a forty-plus football fan who was brought up in the era of Sensible Soccer it is a little confusing. 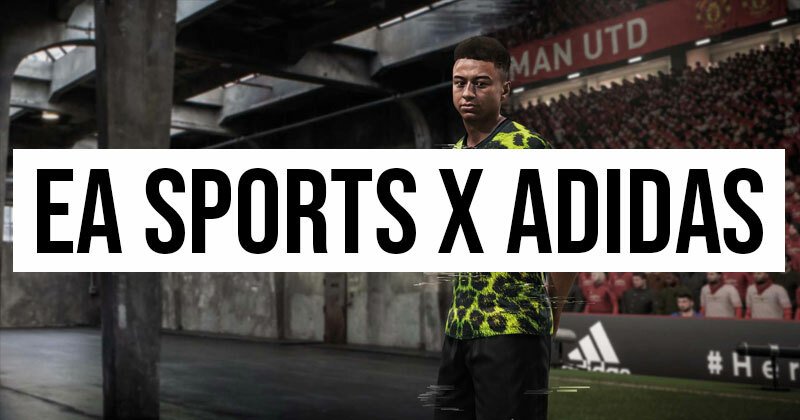 EA Sports and adidas have collaborated and produced a kit each for Bayern Munich, Juventus, Manchester United and Real Madrid, which are now available for serious players of the software company’s popular game. Those who play FUT and have one of the four super-clubs as a team can earn the special kits by completing challenges. At the same time they have released the shirts to buy, but in strictly limited numbers. 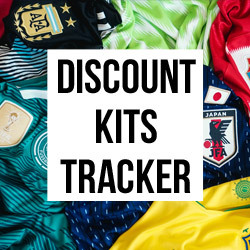 What are the kits like? Well, errrh, to be honest it’s pretty difficult to have missed them. They’re pretty loud. No, they’re very loud. Louder than an away end in full voice after a last minute winner against their deadly rivals. They also won’t please traditionalists, as they seem to deliberately avoid any nod to the usual colours and styles of the proud clubs they represent. The result is full-on. The result is unique. Even the uniqueness is unique. 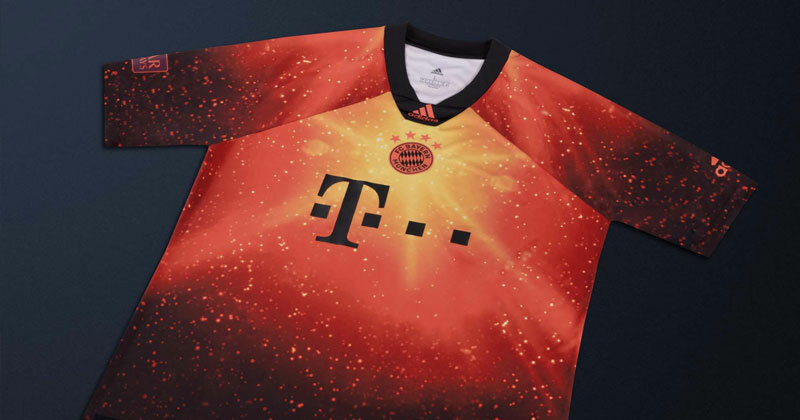 The Bayern shirt does at least carry some red on it. The design carries a sensible all black collar but restraint ends at the neckline. The red-orange-black body features what looks like a supernova explosion emanating from just behind a slightly dwarfed badge. 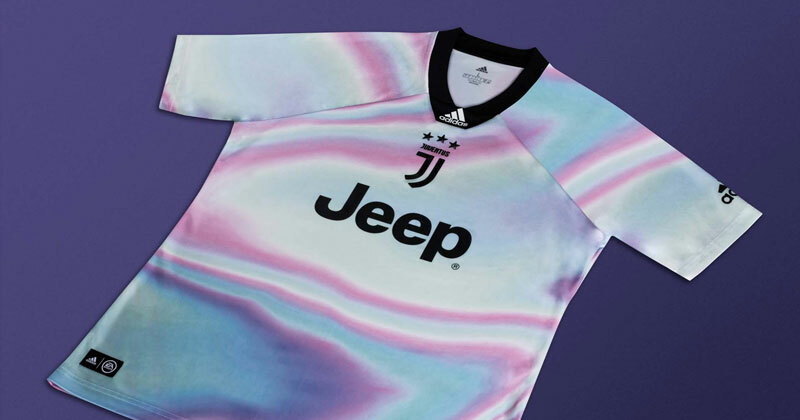 I am no fashion expert (stop laughing at the back) but this just seems a bit too “1989 summer-of-love, global hypercolour, I’m off to an illegal rave in rural Norfolk, pass me the glo-sticks” for my liking. It doesn’t look like a football shirt. 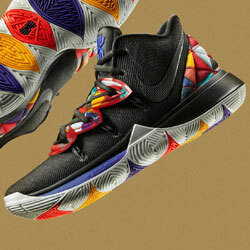 And I cannot see many people buying it for its fashion-aesthetic either. 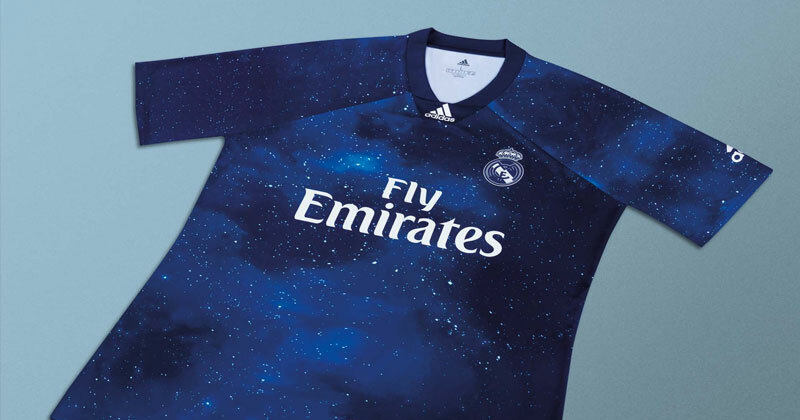 Like Bayern’s it carries a primary colour from the traditional colours of the Bianco-Neri and the design is, dare I say it, really quite pretty. The multi-coloured marbled effect does have a “mother of pearl” (ask your parents, kids) effect but it does work. I think the shirt is helped by the simplicity of both the badge and the sponsor, it works and looks a bit like a training shirt, if not an actual kit. Good effort and a nice shirt. Same template as the Bayern effort but this one works a lot better. The colours are kinder to the eyes and are a bit more inline with the club’s previous away kits. The different blue tones mix together well and produce another shirt which I can see being popular. 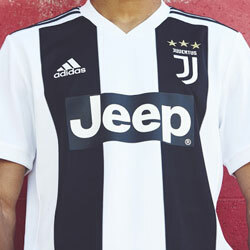 The look produced does suggest training shirt, like the Juve kit, but it is a pleasant shirt. One thing that ruins it is the massive gold FIFA badge, but that maybe just my prejudice against all of these monstrosities. It does balance the club badge on the left breast. I always prefer a club crest over the heart. Wow. They really went for it with this one. No prisoners taken. Cover your eyes. Or not. When I first saw this I was horrified. Leopard print in black and luminous green? Surely this is straight out of the Betty Lynch Coronation Street archives (again, ask your parents, kids). But do you know what? It is a grower. And at the end of the day I loved the Hull City tiger-print kits of the early 90s so why not? Again, it is a little too far out to look like a match-day kit but would work as a training or warm up shirt. I imagine this will be fairly popular amongst younger fans as it is so in your face it’s nose is pressed up against your cheek. Whatever your view on these kits it is unsurprising that they have been produced. 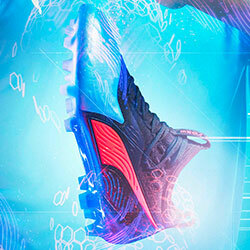 The link between gaming and football has grown enormously since the pioneer games of the late 80s and early 90s. Yes, these shirts are designed to make money, at £65 a pop they seem expensive for something that is unlikely to appear on a pitch, but why shouldn’t those who enjoy football through gaming have something to call their own? With the Premier League establishing their own FIFA 19 league, and with some eight million FIFA players across the UK alone, it is an ever growing audience that would argue they have their own cultural needs that require fulfilment. I agree but wouldn’t want to see any of these kits on the physical pitches across Europe. But for gamers and shirt collectors these offer something unique and special, and there’s absolutely nothing wrong with that.